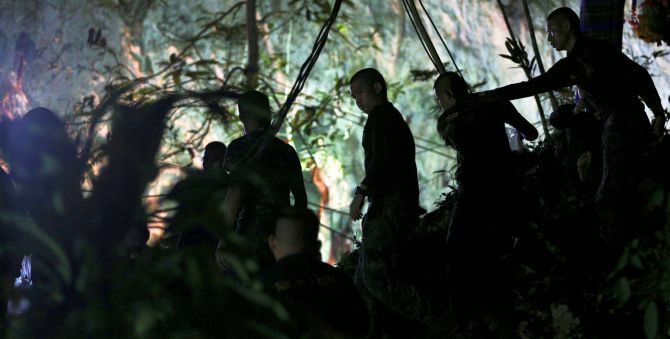 Thai officials ruled out any immediate attempts to evacuate 12 football players and their coach trapped deep inside a system of caves in northern Thailand on Saturday despite concerns over low oxygen levels underground and poor weather forecasts. 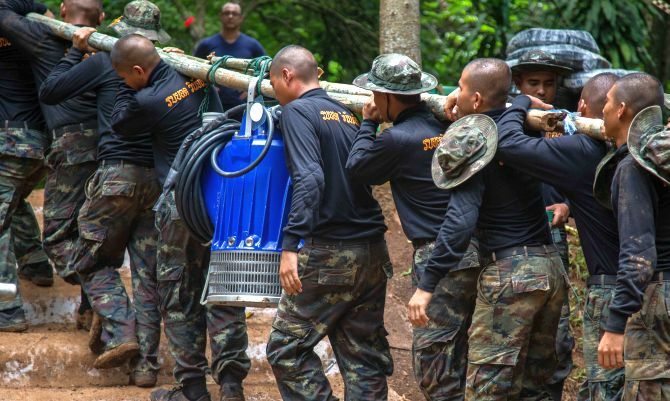 “No, not today,” Narongsak Osottanakorn, the governor of Chiang Rai province, said on Saturday after being pressed by reporters on rescue efforts. Officials are considering a rescue plan involving a “buddy dive” -- where an experienced adult diver would swim with each boy -- to evacuate the team members, according to a US official familiar with the joint rescue operation. 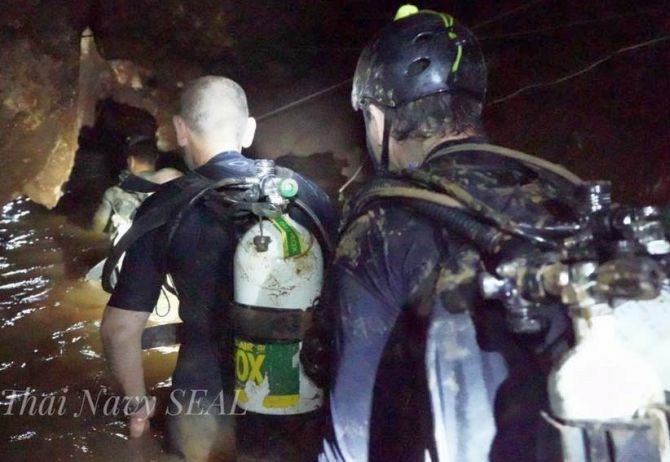 On Friday, Thai Navy SEAL chief Rear Admiral Aphakorn Yoo-kongkaew said oxygen levels in the cave had dropped to 15 per cent, a level that one Thai medic said posed a serious risk of hypoxia, the same condition that causes altitude sickness. Ivan Katadzic, a Danish diving instructor who has been ferrying oxygen tanks into the cave, said to Reuters after a dive on Friday he was “double positive” about the mission because the water level had dropped considerably. 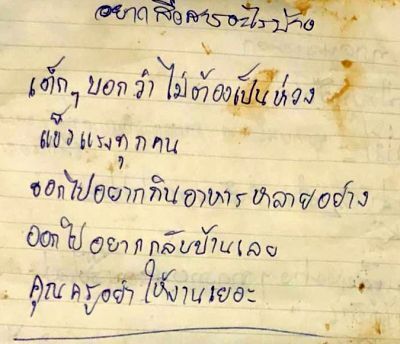 Heart melting notes scribbled by some of the stranded boys and their football coach from inside a flooded cave complex in northern Thailand were posted on the Thai Navy SEAL Facebook page on Saturday morning. “I love you mom and dad and I want to eat pork shabu,” said another noted, reports The Straits Times. 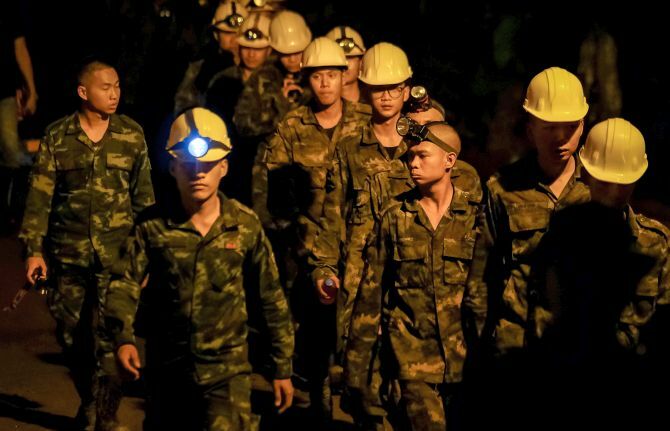 On a related note, the soccer coach trapped in a cave with the 12 boys apologised to their parents in the first letter he and the team have sent out through divers. “To the parents of all the kids, right now the kids are all fine, the crew are taking good care. I promise I will care for the kids as best as possible. I want to say thanks for all the support and I want to apologise to the parents,” wrote 25-year-old Ekapol Chanthawong, the coach of the Wild Boars soccer team.